All matter, including the atoms in our bodies, the air we breathe and the gas in the Sun is composed is combinations of fundamental particles that were created during the Big Bang and subsequent evolution of the Universe. Before giving an outline of the key stages in the formation of matter we need to review the fundamental particles and forces in the Universe. Our current understanding of physics allows us to model events in the Universe nearly, but not quite back to the moment of the big bang. Significant developments in our understanding of the very early Universe are due to advances in high-energy particle physics and particle accelerators such as those at CERN. According to the "Standard Model" of particle physics we now know that all the matter around us is composed of combinations of only a few fundamental particles. These twelve particles fall into two families, quarks and leptons. 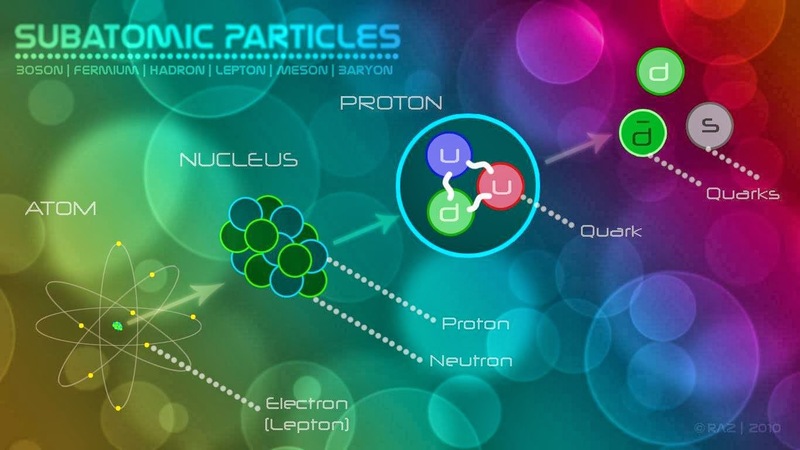 Quarks are the particles that group together to form hadrons. Hadrons made of three quarks in turn are called baryons. The most familiar baryons to us are the protons and neutrons that comprise the nuclei of the atoms in our bodies and the rest of the Universe. A proton comprises two up quarks and one down quark, whilst a neutron has two down quarks and only one up quark. If you study the following table you will see that quarks have charges that are fractions of the charge of an electron, e. Hence the overall or net charge of a proton = 2 × (+2e/3) - 1 ×(-1e/3) = +1e and the overall charge of the neutron is 0. Leptons include three charged particles, the electron, muon and tau particle. Each of these has an associated neutrino particle that is neutral. Together these twelve particles are the building blocks of matter. Interestingly though, each of them has a corresponding antiparticle. These differ only in having the opposite charge but have the same mass as the corresponding matter particle. These antiparticles collectively are known as antimatter.